Sun-Thurs 11:00 A.M. - 10:00 P.M.
Fri-Sat 11:00 A.M. - 11:00 P.M. Located on the grounds of Franklin’s Hillview Country Club, Big Woods Franklin joined the Big Woods family in 2017. 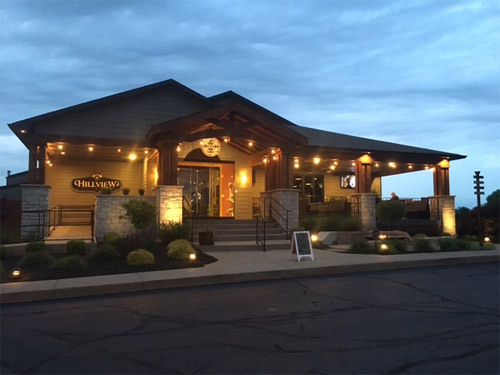 Overlooking the scenic Hillview Golf Course, our family-friendly restaurant offers indoor bar and table seating, as well as patio seating for pleasant weather days. Big Woods Franklin features the Big Woods brew pub menu, a monthly feature menu, craft beer from Quaff ON!® Brewing Co., and artisan spirits from Hard Truth® Distilling Co. We are open to the general public as well as club members. To find us, simply follow directions to the Hillview Country Club. Get the Big Woods Experience Newsletter from Big Woods, Quaff ON!, and Hard Truth. SIGN UP NOW!